In the late 1970s and early 1980s, Alec Clifton-Taylor made a series of programmes with the BBC entitled Six English Towns, Six More English Towns and Another Six English Towns. He was principally interested with showing off the wonderful survivors of beautiful architecture that was available to discover in our towns across England. Although a simple premise of looking at buildings, he did it with such charm and authority, it became a landmark series. That was thirty years ago. Much of what he showed us still remains, fortunately, but in that time towns have expanded enormously and a lot of our heritage has been swallowed up and tucked away behind the commercial hoardings, large plate-glass windows and new utilitarian constructions; what survives nowadays is often ignored or taken for granted. Lyme Regis is a coastal town in West Dorset, England, situated 25 miles west of Dorchester and 25 miles (40 km) east of Exeter. The town lies in Lyme Bay, on the English Channel coast at the Dorset–Devon border. It is nicknamed “The Pearl of Dorset.” The town is noted for the fossils found in the cliffs and beaches, which are part of the Heritage Coast—known commercially as the Jurassic Coast. Barnstaple or is a former river-port, large town, civil parish and the capital of the local government district of North Devon in the county of Devon, England. Since 1974, it has been a civil parish governed by town council. Bridgnorth is a town in Shropshire, England, situated on the Severn Valley. It is split into High Town and Low Town, named on account of their elevations relative to the River Severn. Newark-on-Trent is a market town in Nottinghamshire in the East Midlands region of England. It stands on the River Trent, the A1, and the East Coast Main Line railway. Sandwich is a historic town and civil parish on the River Stour in the Non-metropolitan district of Dover, within the ceremonial county of Kent, south-east England. It has a population of 6,800. 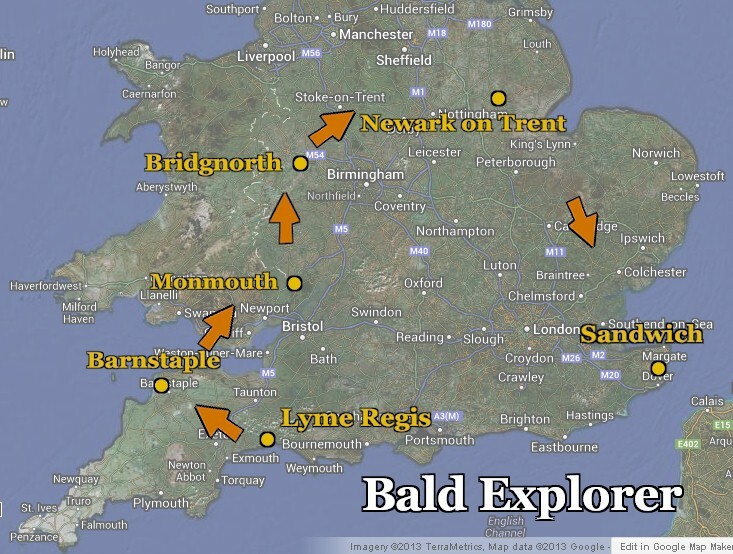 I do hope you will support our fund-raising efforts, tell your friends and family about the project and following the progress here on the website and on Twitter (@BaldExplorer #BaldExplorer) and of course Facebook too.